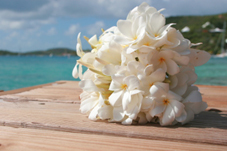 A tropical wedding bouquet can be simple and elegant, or an extravagant, breathtaking display. The bridal bouquet will typically be larger than the bouquets the bridal attendants carry down the isle. There are endless possibilities when it comes to wedding bouquet flowers. What should you consider when choosing the perfect bouquets? Will your wedding be formal or informal? Simple or elaborate? 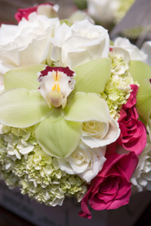 The tropical wedding bouquets you select should reflect the formality of the event. The location of your event, as well as the time of year, will determine the tropical flowers you can include in your wedding bouquets. If you live in a warm climate, or are having a destination wedding in an exotic location, the variety of tropical flowers available will be abundant. If you live in a cold climate, or your wedding is scheduled during a cold season, consider using cold hardy tropical look-a-likes, or have true tropicals shipped direct. Have you chosen the style for your bridal and bridesmaid gowns? A wedding bouquet should compliment (not compete with) the style of the gowns you choose. The wedding color scheme is typically reflected in the wedding bouquet flowers. Flower colors for tropical weddings range from bright and bold to subtle and elegant. What type of flowers do you prefer? Tropical blooms can be big and bold or small and elegant. What type of fragrance do you like? Some tropical flowers are heavily scented while others have little or no fragrance. What’s your wedding flower budget? How much have you allocated to wedding bouquets? It’s a good idea to know your numbers before you meet with the florist. Also know the amount of bridesmaids and groomsmen in the wedding party as well as the number of tables at the reception. Did you know that wedding bouquets can double as decorations for the head table? Do you have a specific style in mind? Tropical wedding bouquets come in variety of shapes and styles. The bouquet style you select should complement the design of bridal and bridesmaid gowns as well as blend in with the wedding theme. If you haven’t already, find an experienced wedding florist. Ask for referrals from friends and family. Schedule an appointment with a few different florists to compare pricing estimates and samples of their work. Book your florist well in advance. Experienced florists are busy, and have a tight schedule. Keep in mind that some venues and wedding planners will only work with specific florists; however, if this is the case, you should be notified well in advance.